The C64 extensions are modules/plugins to add special features to the C64 emulator. This extensions are packed together in one installer and can be downloaded here. 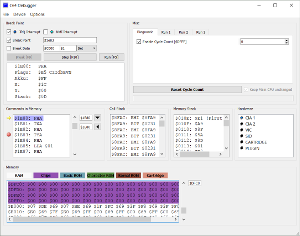 Extensions download - and keep the C64 Emulator up-to-date. With the video extension you are able to save a video file during playing or working with the emulator. Just activate the video recording by pressing the insert key. With the GIF extension you are able to save a gif animation file during playing or working with the emulator. Just activate the recording by pressing the insert key. The user is able to develop extensions with the TScript engine (TScriptDll.dll). script_serial_file.tsc - load and save programs directly into your "My Documents" folder (as prg files). Debug your C64 programs include viewing assembler statements and memory. This is more a technical study and for fun. The extension simulates a multi-bank cartridge with an included asm program on it, which will be copy itself into the ram after execution. The program always switch to the next bank of the cartridge and copies the buffer into screen ram. The extension provides a single picture from the camera input, every time the bank selection changes. That means you can see a very simple video of the camera input. This is the beta version of an ESP8266 and an user-port RS232 modem. This extension provides the two modems, a web configuration, a REU Ram extension and an interface to provide the data transfer. The data transfer can be done through a TCP network server or an executable file (in-out pipes). See the interface header (written in C) for details. Additional there is a "C64_Extension_Interface.chm" help file available in the C64 program folder after installing the C64 Emulator.